Fisher-Price Little People World of Animals See 'n Say - Best Price! The Fisher-Price See ‘n Say is still a popular toy among toddlers and preschool aged kids! This updated version on Amazon has two pages of animals for children to learn. 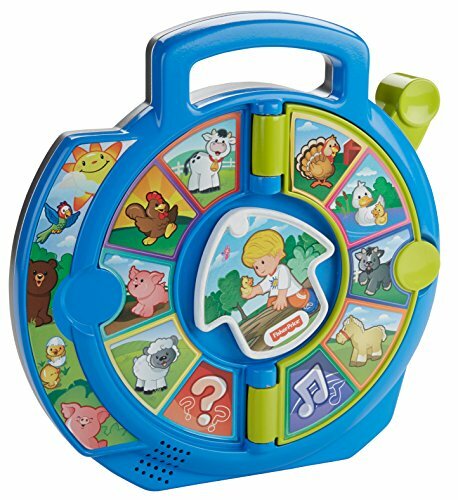 Hurry and get the Fisher-Price Little People World of Animals See ‘n Say today for only $8.00 from Amazon! Save 47% off the regular price of $14.99 making this the lowest price ever on Amazon! (Minimum purchase is 2.) Check out all of the recent Amazon deals here! Shipping may be delayed a couple days. Once available, Amazon Prime members get FREE 2-day shipping!! If you are not a Prime member, get FREE shipping when you purchase $25 or more of eligible items across any product category. Get the Fisher-Price See ‘n Say details below. From the farm and into the wild, the Little People World of Animals See ‘n Say is opening up the world of the animal kingdom to introduce kids to the names and sounds of a wide variety of creatures. With two exciting pages—one dedicated to farm animal friends and one for exotic wild beasts—this spin on the classic Fisher-Price See ‘n Say will ignite their curiosity while boosting those all-important fine motor skills. To start the learning fun, select a page, then point Eddie to an animal and pull the lever to discover its name and hear what it says! Little learners can even put their knowledge to the test with a stimulating quiz mode! Simply point Eddie to the question mark, pull the lever, and the See ‘n Say will ask your toddler to find a chosen animal. Kids then spin the arrow to point to their answer and pull the lever to find out if they’re right! For musical fun, point Eddie to the music note, where your toddler will delight in silly songs about the animals on both pages. Where development comes into play. ​Fine motor and sensory: Toddlers boost dexterity as they move the arrow and pull the lever to hear different sounds. Cognitive: Build their sense of wonder as they discover new animals and learn the animals’ names and sounds! Social/emotional: Kids can gain confidence as they test their knowledge about their new animal friends in quiz mode. Buy the Fisher-Price Little People World of Animals See ‘n Say from Amazon.